"During her long Met career (1940-1966) Licia Albanese was particularly identified with the music of Puccini, and there are recorded examples of her in many Puccini roles, either studio or live recordings. 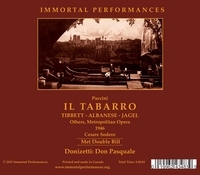 There is, however, a single performance of her Giorgetta in IL TABARRO preserved, and it is this one. 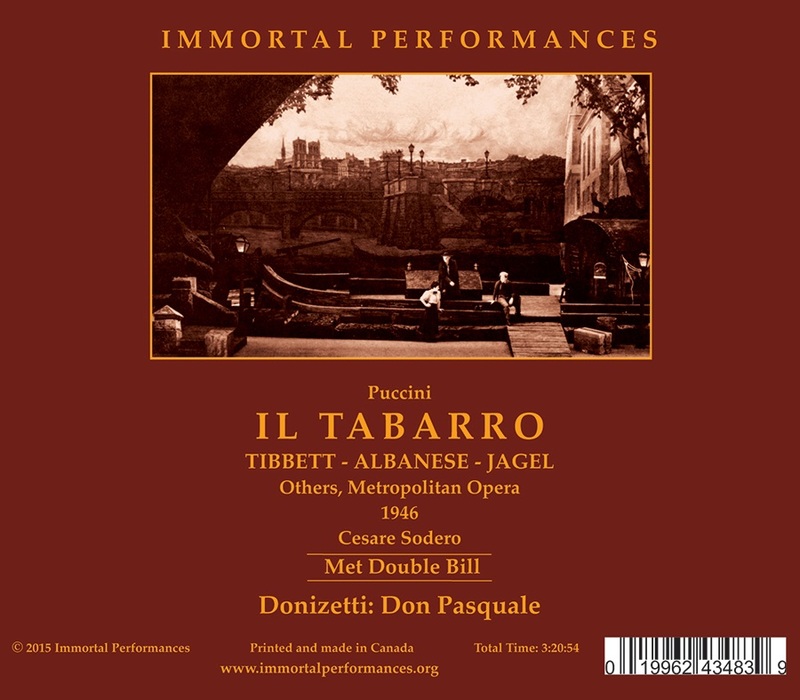 How fortunate we are to have it, particularly paired with Lawrence Tibbett’s Michele. The fervor and the innate feel for the Puccini idiom that both artists convey in their scenes together is not duplicated in any other performance of which I am aware. 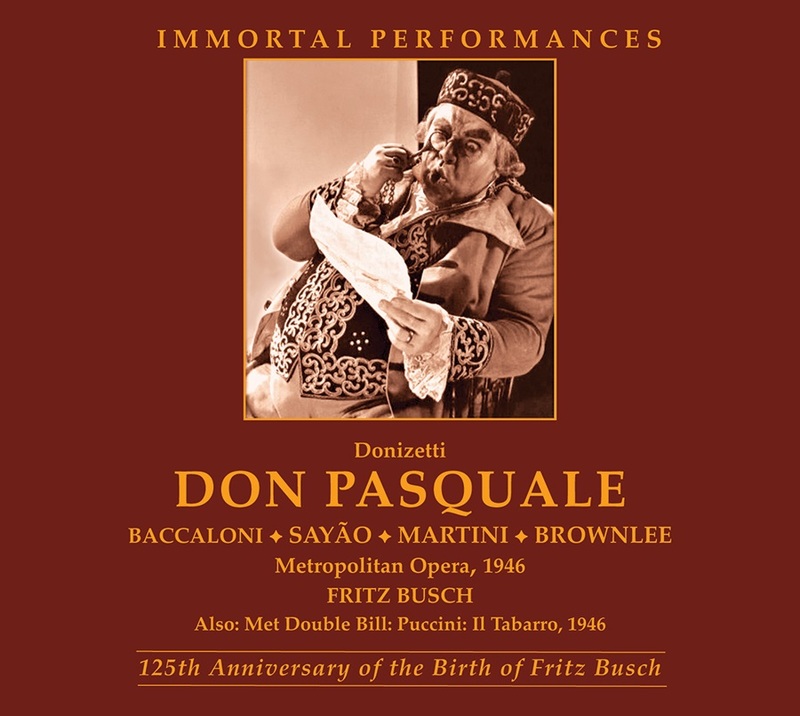 This [DON PASQUALE] is a treasurable opportunity to experience a Donizetti opera conducted by the great Fritz Busch, and from the opening of the Overture we understand that this will be a unique experience. The degree of attention to dynamic shading and to orchestral balance and texture is remarkable, and Richard Caniell has made special efforts in his restoration to preserve that dynamic shading and the performance’s dynamic range. There is spring in the rhythms, there is flexibility in the shaping of melodic lines, a sparkle in the string playing, an effective and intelligent application of rubato, and an attention to phrasing that we almost never hear in this music." "...Sayao provides vocalism of real distinction, vocalism of perfect poise and point in the most intricate roulades, of bewitching grace in cantilena, always in the service of character. She is mistress of the role from first to last, and Busch's tempi offer her innumerable of real distinction, vocalism of perfect poise and point in the most intricate roulades, of bewitching grace in cantilena, always in the service of character. She is mistress of the role from first to last, and Busch's tempi offer her innumerable opportunities for characterful nuance."